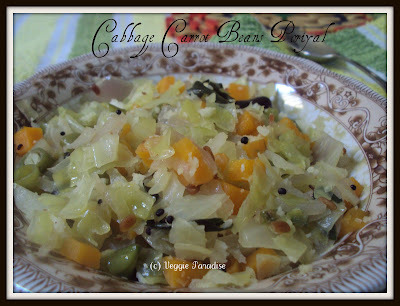 Poriyal makes us easy to eat healthy vegetables and here comes a poriyal with 3 vegetables- cabbage, carrots and beans. 2 cups of chopped cabbage. 1/2 cup of chopped beans. Add the chopped onion, fry until they turn translucent. Add the chopped vegeatbles along with salt and saute them for 2 min. Pour half cup of water and cover the pan with a lid and cook in low flame. Cook until the vegetables are softened and water gets completely evaporated. Delicious and colorful poriyal.. looks perfect !! Love this tri colour poriyal anytime, tastes absolutely divine with rasam..makes me hungry. 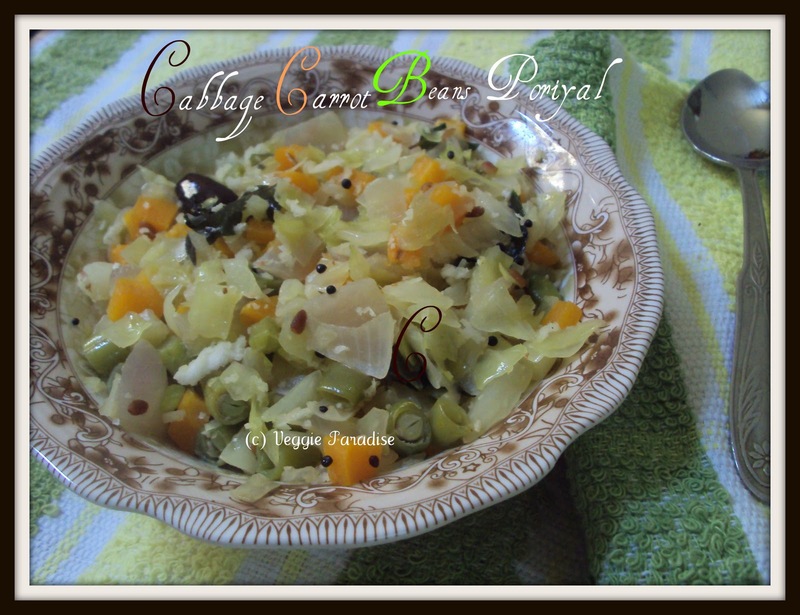 This certainly is a nice side dish..
Cabbage carrot Beans poriyal looks really good Aruna. What a beautiful and fresh looking poriyal. Thats such a healthy and delicious poriyal! Love this simple and healthy poriyal, Aruna..Easy to prepare and tasty too..
very nicely presented! Yum Yum!